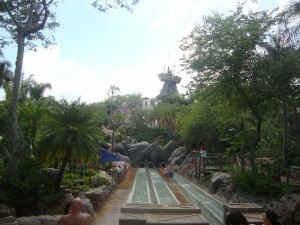 Mickey Mouse boasts two water parks, Typhoon Lagoon and Blizzard Beach. The later is much larger, but usually also has a larger crowd. Typhoon Lagoon is a bit more relaxing in its tropical-themed decor. Two benefits this park has over its sister location is the Shark Reek that allows guest to snorkel with baby nurse sharks and wave pool that offers more intense thrills. As the newest of Orlando water parks, Aquatica has received a lot of attention for its innovative rides including a relaxing lagoon that provides up-close views of tropical marine life, dolphins jumping over a water slide as riders descend down it and a lazy river with aspects of a white water rafting trip. Just as it is known for the best extreme rides among amusement parks in Orlando, Universal also has the most adventurous water park with Wet ‘n Wild . Among the most notable are the Black Hole (as implied it is a ride in the dark), Disco H2O that spins riders round and round repeatedly in a funnel,plus seven (7) multi-person rides. In addition to the rates mentioned above, Aquatica and Wet ‘n Wild offer additional discounts if you purchase your tickets online or if you are a Florida Resident. Additional discounts can be obtained by combining a water park pass with theme park admission or buying an annual pass for more than one year. This entry was posted in Attractions and tagged aquatica, blizzard beach, disney world, memorial day, seaworld, spring break, summer, typhoon lagoon, water parks, wet n wild. Bookmark the permalink.